This boat is somewhat of an icon in ski racing. 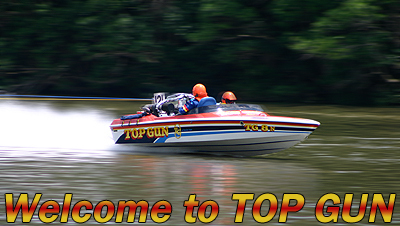 Like “Stinga”, Top Gun is a Roger Connelly built boat. I am guessing 15 years old; this is the second Top Gun. Tony McLeod and Ross Christenson were the previous 2 owners. It has been kept in immaculate condition and no doubt rarely is used other than testing and competing in the seven big river classics. Top Gun has competed in 4 World Ski Racing Championships; 1999 Spain, 2001 Vegas, 2003 Long Beach CA and 2007 New Zealand. Available soon will be on board footage and helicopter footage from the Sydney B2B.